Restaurants : Shamrock Cafe, Limericks Steakhouse, Molly's Buffet. Standard room amenities : Air conditioning, alarm clock, cable TV, desk, hair dryer, in-room safe, iron and ironing board, PPV movies, radio. 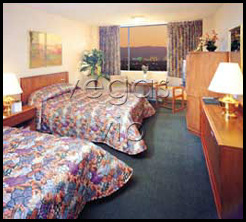 Hotel amenities : Enterprise Rent -a-car, laundry service, room service, safety deposit box,tour show desk. 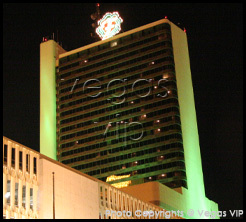 At 34-stories high, Fitzgeralds Casino & Hotel features 638 beautiful deluxe rooms with vistas of the city like no other in the area. The motto at Fitzgeralds is to feel lucky. And guests should with such a plethora of free entertainment, two floors of gaming and Limericks Steakhouse, a popular place to go for a great meal in an intimate setting. 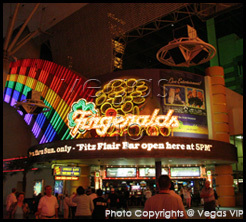 The casino is spacious at more than 42,000 square feet and Fitzgeralds has about 940 slot machines and 29 tables featuring a wide variety of games, including the first Pai Gow Mania table game in Nevada.